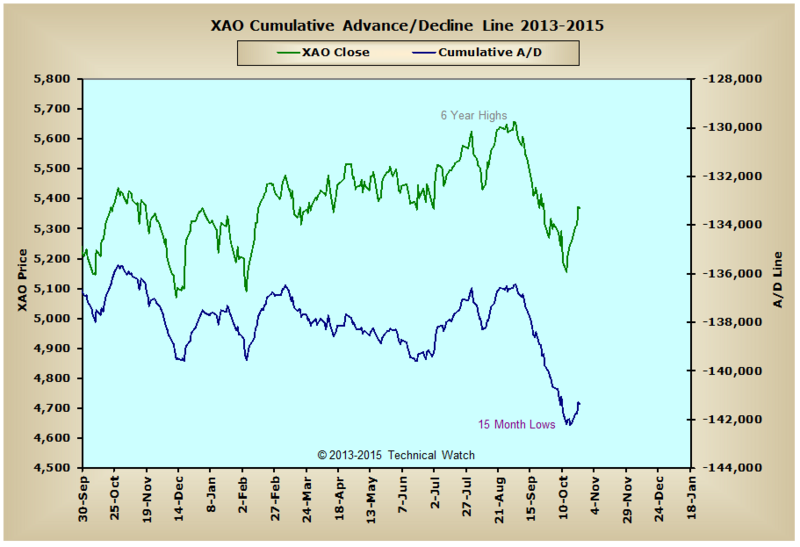 With many of the large cap breadth and volume McClellan Oscillators making new lows this past week, while still others continued to make higher lows during this same time, next week will probably be just as volatile as the market participants begin the process of backing and filling in a fight for control of the ongoing longer term trend in prices. 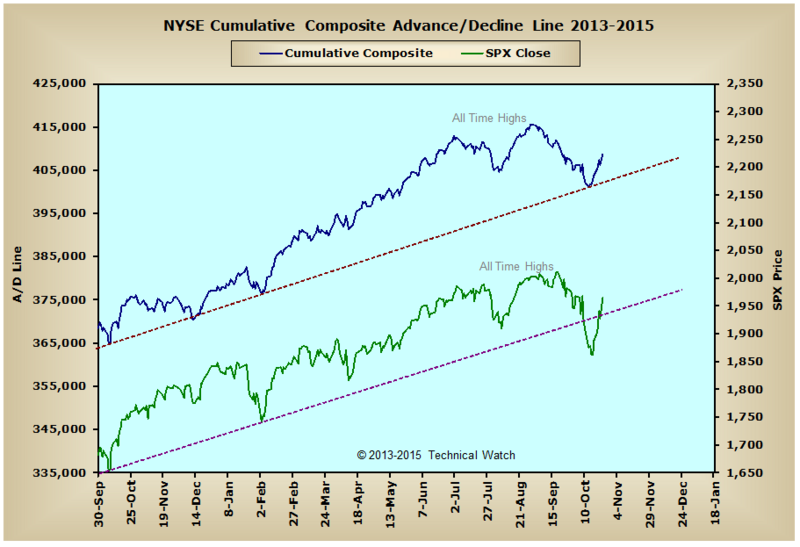 Another volatile week has come and gone, but this time it was the bulls who flexed their muscles driving the major market indices up by an astounding average of 3.8% with the NASDAQ Composite leading the way with a gain of 5.29%(! 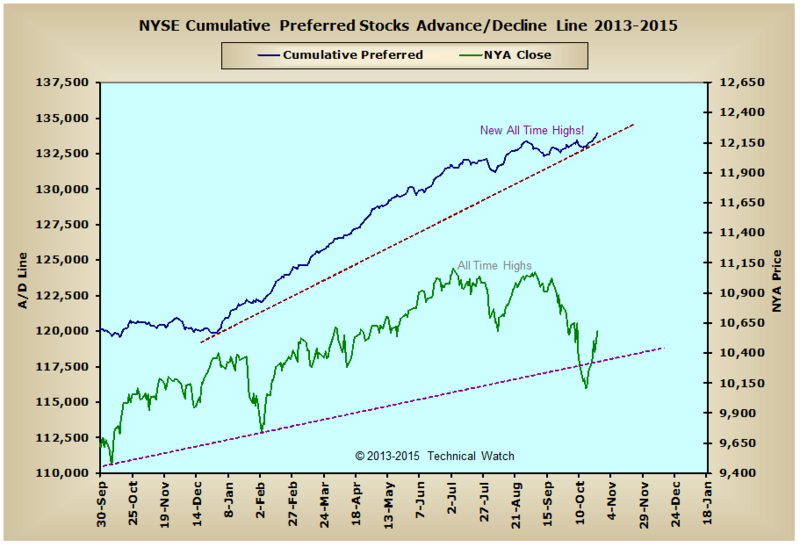 ), while the Dow Industrials brought up the rear with a gain of "only" 2.59% week over week. 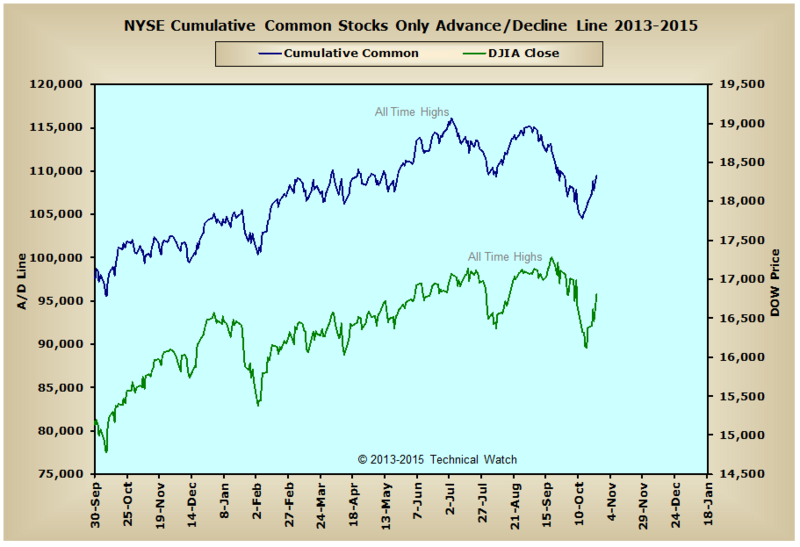 Looking at this week's breadth charts array and we see that the NYSE Composite, NYSE Common Only, NYSE Specialty CEF and NYSE REIT advance/decline lines were all able to move back above their early October consolidation highs before we had our "crash like" sequence between October 9th and October 15th. 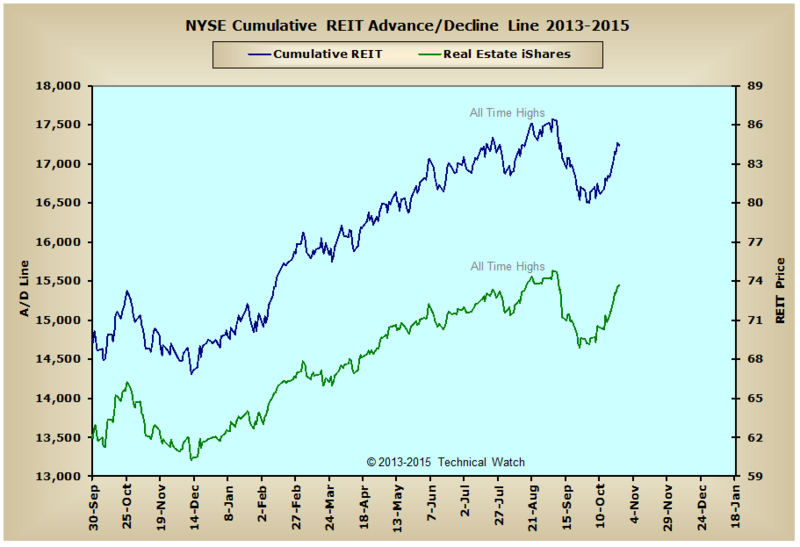 More importantly is that we have money leading prices to the upside in this same effort. Because of these complimentary events, this would suggest that the buoyancy of liquidity prior to the crash event did its job in providing a price cushion and is now moving back into the US equity markets...very much like one would perform a "cannonball" dive off the deep end of a swimming pool, displacing the water temporarily, and the water filling this void just as quickly. 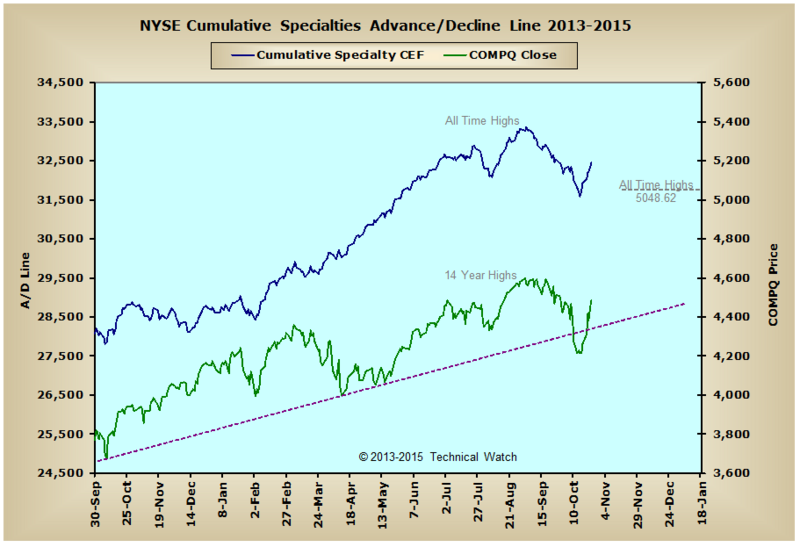 Looking at the NYSE Bond CEF and Preferred advance/decline lines and we see that both were able to close the week at new all time highs helping to re-enforce the notion that liquidity levels remain ample enough to provide further gains in equity prices in the not too distant future. 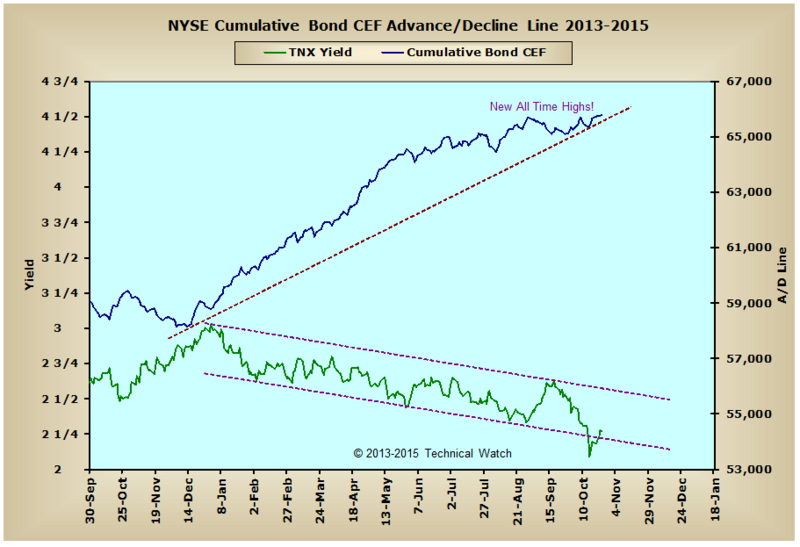 As far as the yield on the 10 year note is concerned, as long as the NYSE Bond CEF advance/decline line continues to make higher highs, not only will current rates remained capped in and around the 2.25% area, but any further upside acceleration in this same money flow component will keep the pressure on rates over the next several weeks toward 2%...with a pretty good chance of eventually revisiting the spring 2013 lows of 1.70%. 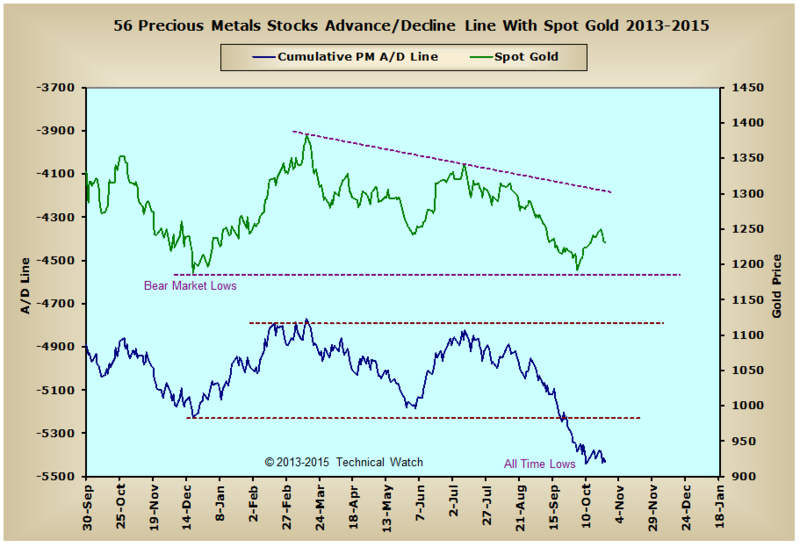 Over in the precious metals asset class and we see that the price of gold and silver continue to hold up well in the face of money flow continuing to be under heavy pressure as represented in the Precious Metals advance/decline line. 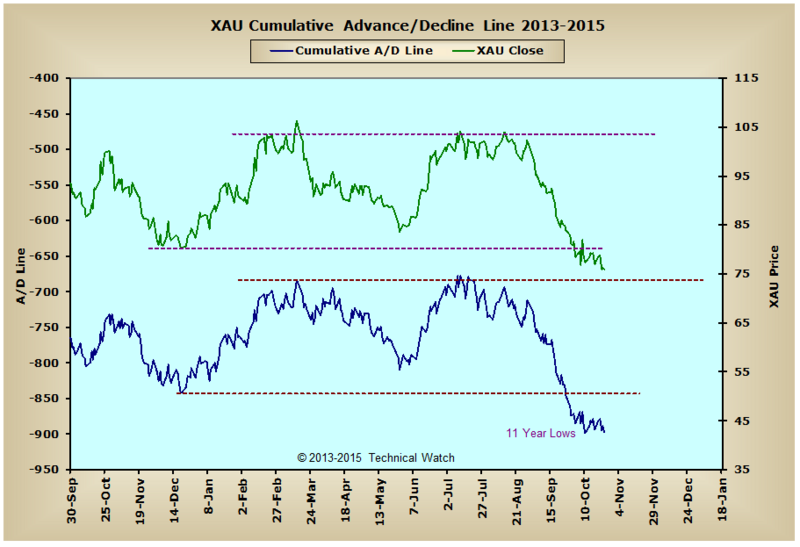 In fact, the XAU advance/decline line actually closed on Friday at new 11 year lows. 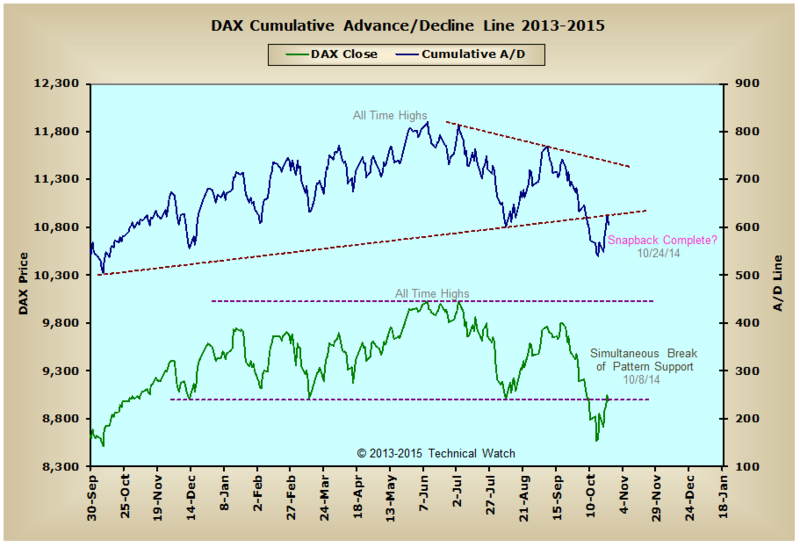 So until we start to see better money flow characteristics in these same A/D lines, metals prices will have a tough time in remaining at these current levels, and once "the bough breaks, the cradle should fall" with a resounding thud. Although things looked good on the surface, the international markets remain quite heavy internally with the Aussie advance/decline line showing very little confirmation of last weeks sharp reflex rally in the Old Ordinaries Index. 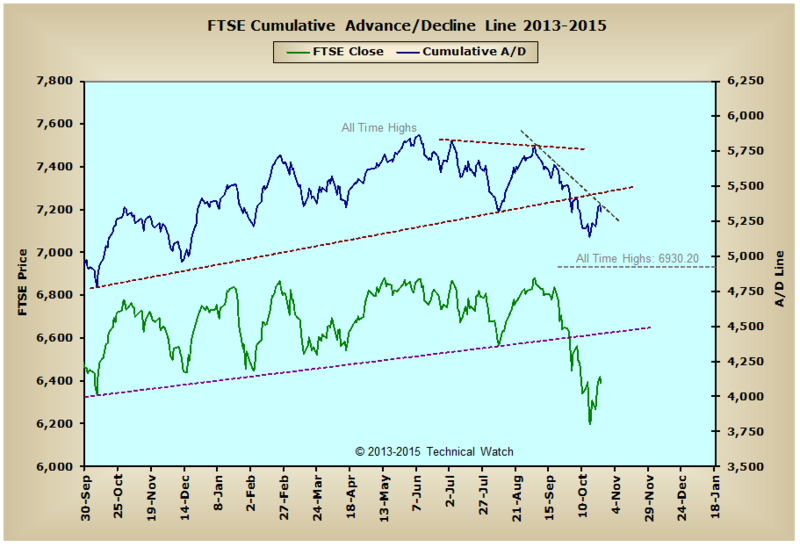 Over in England, the FTSE advance/decline line remains below its short term declining tops line which is helping in keeping this money flow indicator from snapping back to what was its intermediate term rising bottoms line, while over in Germany, the DAX advance/decline line has actually completed this obligatory snapback to what was its previous line of support. Between all three indices then, and unless the buyers quickly come in and flex their muscles as they did in the US markets this past week, it's quite likely that a challenge of the recent lows in all three of these A/D lines will be seen next week, with a successful test then suggesting that enough of a foundation would be in place to where prices can once again re-initiate their longer term advancing price sequences. So with many index price structures having now met to their expected price resistance points, the BETS remaining on the south side of neutral and showing no upside leadership in relation to prices (see cumulative charts post), and the breadth and volume McClellan Oscillators showing some near term loss of momentum, it would appear that our reflex rally has now fully run its course and that we'll see the market take an extended breather next week as being part of the analogy of pouring a solid foundation from where prices can actually trend higher later on. In this process, prices should remain highly volatile, and quite choppy, with much of any pullback being absorbed quickly by the high levels of liquidity that have returned to the exchanges over the last week. Once all is said and done next Friday, the performance for the month of October should be a mixed affair with some indices gaining slightly while others losing just as much.